The Government Accountability Office recently released a report on government waste. One of the areas of inefficient overlap is with food safety. According to the report, 15 federal agencies administer 30 food-related laws. Some of the oversight doesn't make sense. For example, the US Farm Bill assigned the United States Department of Agriculture responsibility for monitoring catfish, thus splitting seafood oversight between USDA and FDA. 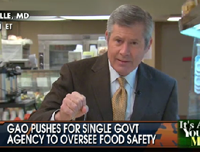 The GAO report found that food safety oversight is fragmented. For example, FDA is generally responsible for ensuring that… eggs are safe, wholesome and properly labeled and USDA FSIS is responsible for the safety of eggs processed into egg products. Also USDA is responsible for health of young chicks, and the FDA oversees the safety of the feed that they eat.